Last September I wrote here about reigniting my passion for knitting with my hand operated knitting machine, Matilda. 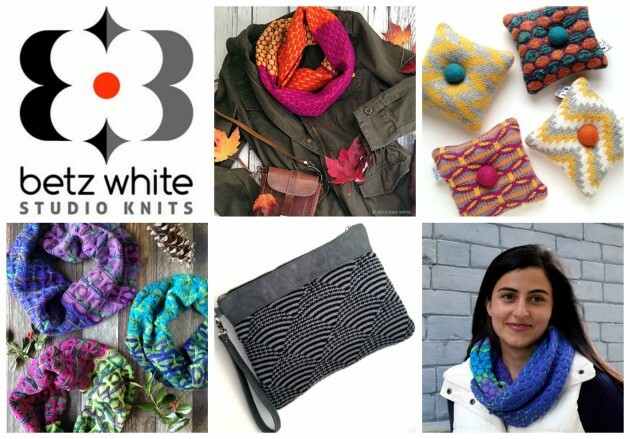 Since then I’ve launched a webshop, Betz White Studio Knits, with cowls, bags, pillows and more. If you follow me on Instagram, I’m sure you’ve seen all sorts of experiments, swatches, and cones of colorful yarn. I’ve been delightfully overwhelmed with the interest I’m getting from followers so I’ve decided to post more of my knitting escapades here on the blog. I love sewing and fabric design and making bags and upcycling and crafting with felt but I also love knitting and so much more. Lately I’ve been thinking about this exploration as “creative cross-training”. Do you know what I mean? Stepping out of your usual making to try something different or perhaps (like I did) revisit a dormant pastime. Sure it’s all fiber and fabric (vs. something really different like painting or pottery) but I can’t get away from the color and texture. It’s inspiring to me and I hope it is to you as well. The newest experimentation for me is something called knit-weaving. It’s still done on my hand operated knitting machine but it involves laying a second weaving yarn across the needles that gets knit/woven into the background yarn. I’ve been playing around with different sorts of yarns, fringe, poms etc! So fun. I’m looking forward to playing with it some more and even doing a little cut and sew with some knit-woven fabrics. 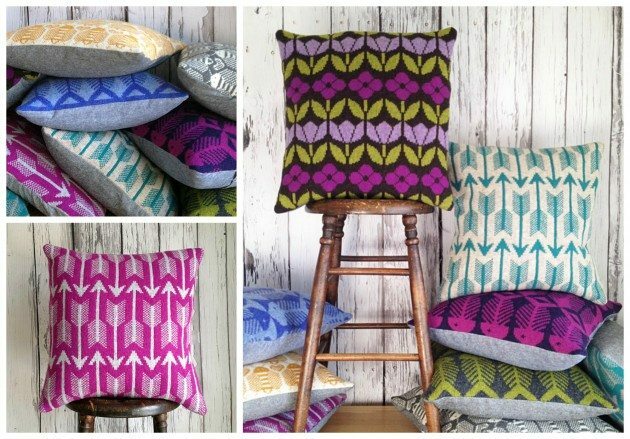 Have you been bitten by the weaving bug at all? What do you do for “creative-cross training” and how does it inspire other things that you do? I don’t weave or knit myself but I totally get what you mean. Sometimes we slip into a creative rut with what we normally do and a simple thing like stepping away into another craft is just what we need to re-inspire ourselves. Personally, I am currently enthralled with surface design and I especially like it for the fact that it requires no real materials and any “failed attempts” are not cluttering up my space!